Disclaimer: I know nothing about trains. I also know nothing about train games. Oh, I’ve played Ticket to Ride, because everybody has played Ticket to Ride, and when I was nine my dad tried to introduce me to the 1977 title Rail Baron, which is a bit confusing because I don’t think they’d even invented trains back then, so it must have been a science fiction game, and either way it fried my brain and left me the perplexed mess you see before you now. Here’s the thing: I don’t like trains. I think they’re smelly, and over-warm, and I get motion sick riding them even though they travel in mostly straight lines. I get nauseated just thinking about them. This means I’m uniquely unqualified to talk about String Railway. So instead, today I’m going to tell you about a nifty little game called String Doomworms. The very first doomworms begin to stretch across the landscape. String Doomworms is pretty interesting despite its compact size, and not only because it has one of the most unique board game themes I’ve ever seen (the slow consumption of the last remaining human bastions in an idyllic countryside by an infestation of enormous doomworms). 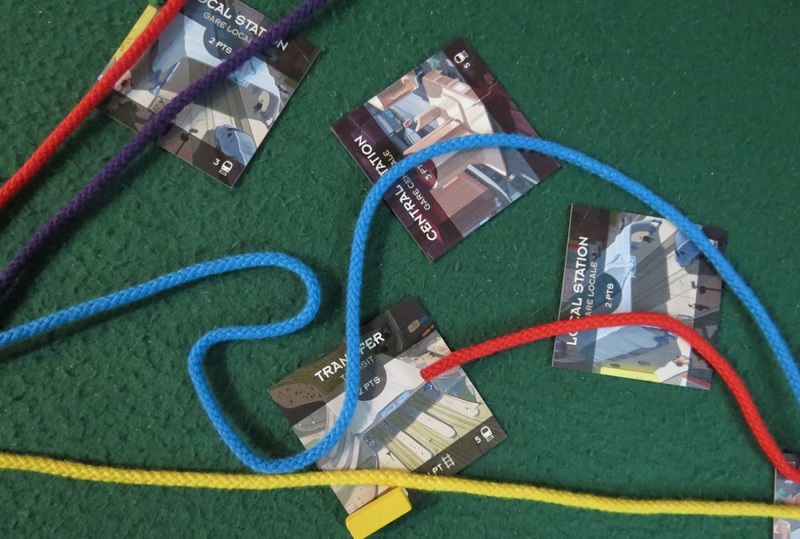 As String Doomworms is a real-space game — by which I mean the table is your board, and pieces are placed in relation to one another instead of in designated spaces — you begin by laying down a few initial strings to set the playing area. 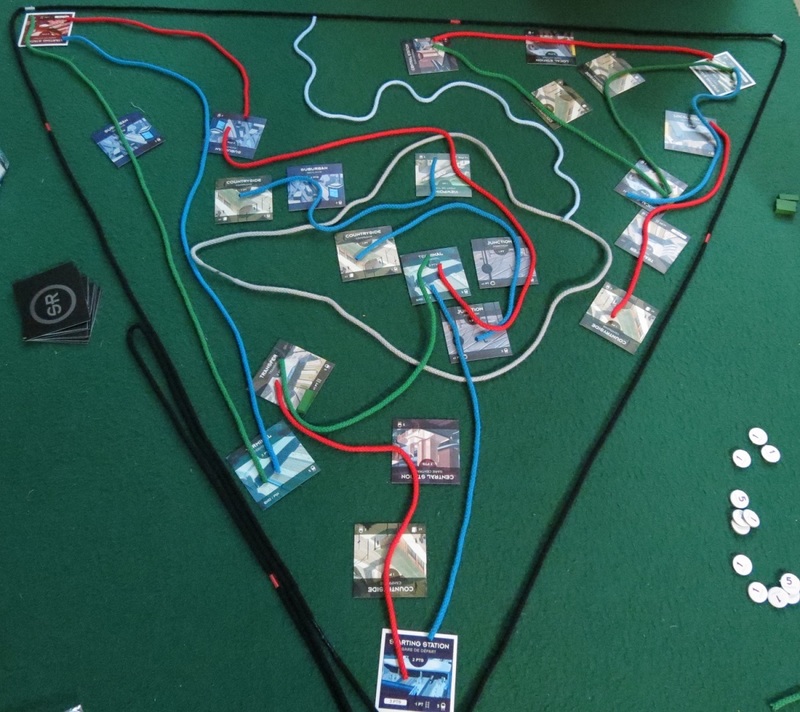 A large black string marks the hunting territory of your worms (as well as the game’s boundaries), while a “mountain” (a grayish-brown string) and a “river” (a squiggly blue string) indicate natural barriers that doomworms can’t cross without incurring abrasions to their squamous hides. 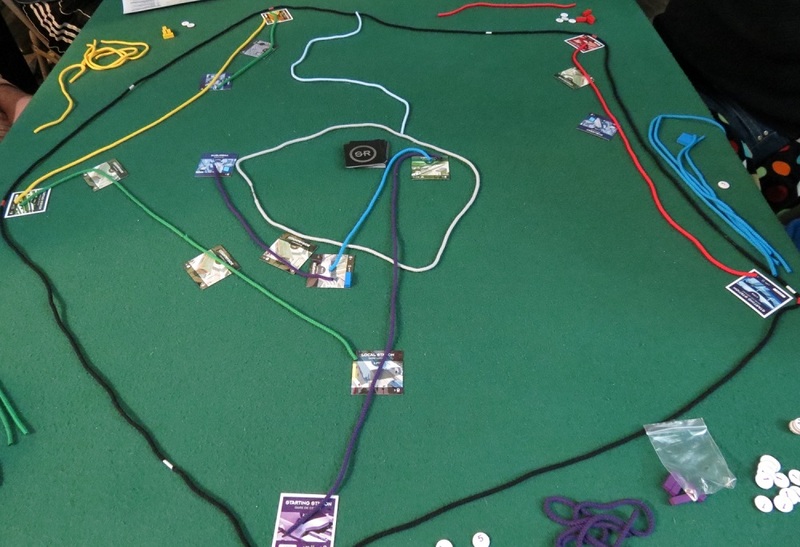 From there, each player goes in turn, laying out “stations” (the hidey-holes of your fleshy human snacks) and then inching one of their doomworms across the landscape, chowing down on as many settlements as possible and counting up how many kilocalories that doomworm devoured. Stations bring all sorts of benefits, limitations, and even DANGERS! These survivor refuges are nicely varied, adding a whole range of extra details to consider. Creeping out from your humble “starting station,” the laboratory birthplace of your apocalyptic monstrosities, you grow outwards until you’re consuming all manner of human settlements, competing with other clews (that’s the term for a group of worms, pretty gross huh?) for sustenance. For instance, there are “Countryside” settlements, worth only a single measly kilocalorie, though the residents are so few in number that you won’t have to share your grim supper with other doomworm clutches. Larger bastions, like the “Central Station” where the resistance hopelessly focuses their resistance efforts, or “Transfer” points where the electrical grid still hums, provide more satisfying meals, though multiple doomworms will be able to glut on the abundant victims that populate those locales. You can even claim “Towns” as your own private feeding grounds, chowing down when you first arrive but losing points when other megadriles squirm into town in all their peristaltic glory. And those are just the simpler options. There are also “Junctions,” hubs of human travel that are basically the doomworm equivalent of free soda refills, feeding you juicy kilocalories every time a worm passes through. “Terminals” are strongpoints that require one your doomworms’ ends (either will do, they have two brains) to bust through, and “Viewpoints” offer greater rewards when placed atop the mountain, as a doomworm enjoys a snack all the better if it can feel the warmth of the afternoon sun on its clitellum. Wow, that’s a really gross word, isn’t it? In addition to ingesting as many homo sapiens as you possibly can, you must also steer clear of obstacles. As I mentioned above, rivers and mountains will decrease the points you earn from eating, as will crossing the paths of other doomworms. This leaves room to place your doomworms strategically, curling them around prey so that enemy clews must cross your territory en route to sustenance. Of course, since settlements themselves are so labyrinthine, doomworms can freely cross each other’s paths at those points — though outside of human strongholds, anything goes. And it often does, as doomworms regularly slither to other players’ home nests to rob some of their accumulated bounty. By the end of the game, as the table fills with what gradually looks like sock-puppet barf, you can almost hear the tiny screams as your doomworm empire expands and other players curse your fantastic luck at squirming through a countryside town, an orphanage-filled suburb, an ever-bounteous junction, and finishing up by breaking into a fortified terminal for dessert. That moment is glorious, though it also drives home the point that this is definitely a lighter game, with many of your opportunities parceled out by luck instead of by ruthless doomworm placement. Regardless of the game’s luck component, String Doomworms is a fabulous real-space game. For such a compact and affordable package, it’s packed with excellent and simple gameplay, the perfect before-game-night filler for everyone in the family. Or it would be if it weren’t for the theme, which some womenfolk and young children might find objectionable. Maybe one day someone will re-theme it into something more family-appropriate. Like highways. 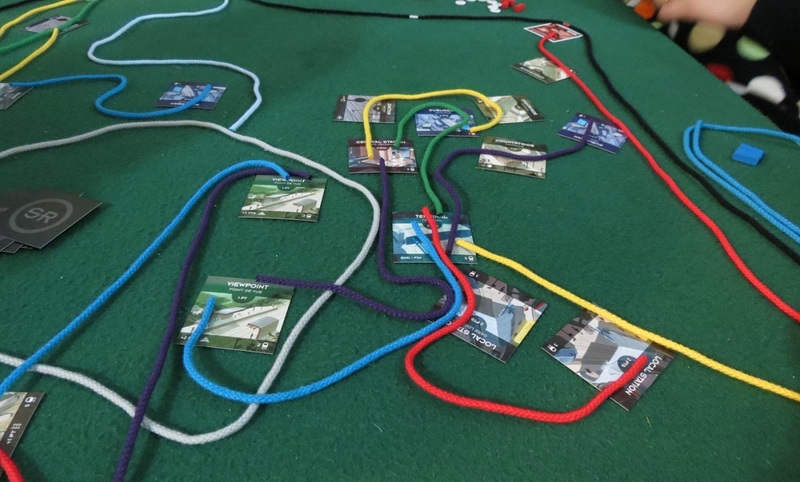 Posted on October 1, 2013, in Board Game and tagged Board Games, FoxMind, String Railway. Bookmark the permalink. 7 Comments. You have just made this game awesome. I cannot wait to begin the unholy feast! I agree with the above. Also, it cannot be overstated as to how amazing a word “squamous” is. Pingback: Wallets of Turbo Party Pilgrims | SPACE-BIFF!